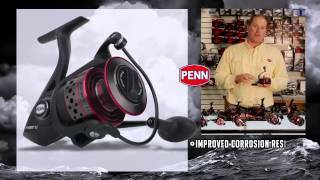 This Penn Fierce II 2500LL Spinning Fishing Reel offers anglers dependability and unparalleled power at an affordable price. Penn has designed this reel with a Liveliner Bait 'N' Run function for putting your reel in free spool mode allowing you to set the hook with stealth and also features a full metal body and sideplate, a stainless steel main shaft and boasts and attractive 4+1 stainless steel bearing setup. The 2500LL size Penn Fierce II reel has been engineered to deliver unwavering performance in the rough Australian conditions. to ensure performance, Penn has produced a line capacity of 6lb/255yd Mono coupled with a max drag of 6kg and all just weighing in at 280 grams. This Fierce Liveliner spin reel is ready to be fished with both Braided and Monofilament fishing line and is sure to be an asset whether you are on the boat or casting from a jetty. Fish species you may target with this reel include Bream, Whiting, Taylor etc. & don't forget we also offer FREE freight for Dinga Club members!